What is Gateway: the City’s Reason? Why St. Louis? Because we can. There is enough talent and technology in the region to create, write and produce a high-quality television series and share it with the community and other communities around the world. Other reasons to work in St. Louis: it’s where the creators live, the combination of beauty and flaws that this city has, its decay and its promise, its great baseball and good beer. St. Louis has been called the Gateway to the West, the jumping off point for pioneers. We’re asking, why not one of the Gateways to the future? Of course, 19th century expansion was misguided in many ways. And “expansion” may not be the smartest way to think about the future. So our memorial, the 630 foot Gateway Arch at the Museum of National Expansion might need to change its name to the Gateway to the future. Why not learn from our mistakes as well as our successes? In the Gateway-TCR franchise, St. Louis is a sustainable community where the current needs of its citizens are met without compromising the ability of future generations to meet their needs. 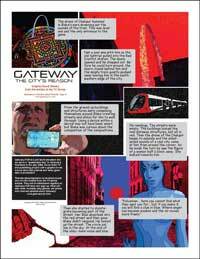 Gateway-TCR is not a utopia or a dystopia. There are still crime and passion. Baseball and apple pie. A delicate balance between progress and conservation exists. There is struggle and there is wonder… but for all of this, there was a price. There is always a price. How will the series be distributed? Thanks to our sponsors, you’ll be able to watch episode segments for free — right here on this web site. Episode “segments” will be posted in the “See Episodes” section of this web site. Each segment will be approximately 10-15 minutes in length. We’ll post segments as they are produced. When all the segments of an episode are complete, we will aggregate the segments into a single episode for release on Vimeo, Amazon and other web distribution outlets. We will also explore local broadcast opportunities and distribute the series on DVD. When will the episodes be available on demand? Our planning calendar calls for one episode segment per month starting in Q4 2015. With the help of our sponsors that means the first aggregated episode will be ready for distribution in the spring of 2016. How can I sign up to be a fan? It’s easy to join hundreds of other Gateway fans who receive our newsletters and other information about the TV series, graphic novel, e-book short stories, special promotions, contests and prizes. Just sign up on the form in the column to your left or click on the image below. No bucks. No Buck Rogers. It’s no secret that even an independent production needs substantial financial backing. We’ve been very lucky to have close to 100 professionals volunteer their time and talent to get this project off the ground. They believe there will be substantial return on their investment. And we think Gateway will be a pretty good investment for our advertisers, sponsors, investors, crowdfunding backers and fans as well. Sign up (see the form in the left column of this page). Share us with your contacts. All the world’s a “sustainable” stage. It’s about context. It’s about the platform upon which Gateway-TCR stories take place. We did a presentation on this topic at the 2013 Webster University Sustainability Conference (see Media Room). In developing the series concept, we asked: What would it be like to live in a future more like Roddenberry’s Star Trek than Huxley’s Brave New World? What would life be like in a sustainable city? What would it be like to live in a place that practiced good old fashioned conservation of resources and at the same time developed advanced technology to do the same? Stories, film and television can help people bridge the gap between what is now and what is possible. Gateway: the City’s Reason envisions a future with mostly positive outcomes — where good old American optimism touches everyone. That’s the stage upon which Gateway-TCR stories take place. And we think it’s a stage that citizens should see more of today. What is -50 | 0 | +50? Who are the Sustainable Stage Hands? They are the sustainability professionals, thinkers, artists and citizens helping us define and build the fictional “sustainable stage” upon which Gateway-TCR stores will be told. And hopefully, they are the heroes turning this fictional stage into a future platform for better communities. What is True Cost Capitalism? * No negative externalities (in other words businesses & consumers must pay the true cost of doing business – or be moving in that direction). Interest and demand for “lower true cost” products and services is already strong and will only grow in the coming years. Is your business ready? Do you have “marketable differences” that position your brand as Lower True Cost? Find out. Take the audit. What is the Fair Game Democracy movement? Imagine that in the beginning of the 21st century Americans realized that most of the problems with the current economic and political systems could be solved, or at least improved, by following a simple set of “Fair Game Democracy” principles? Through that simple set of principles, we demand of our economy and government the same fairness we expect when we play, or become fans of, “games” or sports. What if we did the truly patriotic thing and came together to start a Fair Game Democracy movement? What if we made no more time for the lies of the plutocracy or the childlike logic of the libertarians? We moved fast to save the system from collapsing onto itself and from damaging the earth beyond repair. What if we believed major change could come without apocalypse? What if our actions came from our believe that America is a beautiful shipwreck that is only in need of a few major and many small repairs – just enough to set sail again and lead the world? In fact, what if we believed that a new American was destined to lead the world throughout the coming century? What is the city’s reason? Let’s make a deal! That’s what we do when we live together in a community. We make deals with each other because we have to live with each other. We are social animals. One of the main reasons we “live together” is that it is easier for humans to survive “together.” From the start of human existence up to now and well into our future, has been and will be easier to meet our individual biological, security and higher needs when we live and work together. Today 50 percent of humans live in cities. It is estimated that 75 percent will live in cities by 2050. What if we demand that our communities/cities be set up with systems that guaranteed us the right to work together to have our biological, security and higher needs met? Isn’t that really the city’s reason? What if citizens created a new and sustainable society that was a truly “Fair Game Democracy?” What if citizens made it clear that we understand the power we have “together?” And what if we made it clear that if we don’t have the people’s needs met, the reason for us to peacefully congregate and cooperate will be gone? It’s part of the imagined world of Gateway-TCR 50 years from now and is a major setting for the story arc. But it could become a reality. What if, in 2064, sustainable practices and “True Cost Capitalism” were mandatory and new economies had developed to co-exist with traditional economies? And, what if a subsequent development was Gateway’s “Sustainable Valley” – a “New World Business” center based on sustainable technology. It is similar to the silicon valley of today, except without the negative externalities. It is a major research & development center for innovation in sustainable technology, services and transformation. New markets explode and the visionaries of the early 21st century who invest and incubate these technologies will reap the rewards for decades to come. Entrepreneurs at Gateway-TCR’s “Sustainable Valley” find great financial success, however this financial success is not at the expense other cultures, other local economies, the citizens of earth or the environment.